March 13 the Board of Directors of Realty Income Corporation announced a monthly cash dividend increase of from $ 0.219 to $ 0.2195 per share that’s payable April 13, 2018 to holders of record April 2, 2018. This represents a 0.23% increase to regular monthly dividends. With current price $ 50.55 (today's open), this raise brings their dividend yield to 5.21%. 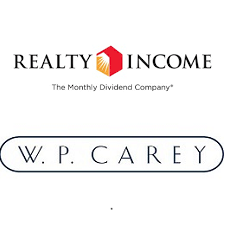 "We are pleased that our Board of Directors has once again determined that we are able to increase the amount of the monthly dividend we pay to our shareholders," said John P. Case, Chief Executive Officer of Realty Income. "With the payment of the April dividend, we will have made 573 consecutive monthly dividend payments and paid over $5.3 billion in dividends throughout our 49-year operating history." Since I own 85 shares of O, this will increase my portfolio's projected annual net dividend income by $ 0.38. That increase rise my YOC to 4.91%. March 15 the Board of Directors of W. P. Carey Inc. announced a quarterly dividend increase of from $ 1.01 to $ 1.015 per share that’s payable April 16, 2018 to holders of record March 29, 2018. This represents a 0.5% increase to regular quarterly dividends. With current price $ 61.88 (today's open), this raise brings their dividend yield to 6.56%. "W. P. Carey has delivered consecutive annual dividend increases since going public in 1998. We are proud of our long-standing track record of providing shareholders with stable and recurring income generation across all market cycles," said W. P. Carey CEO Jason Fox. Since I own 47 shares of WPC, this will increase my portfolio's projected annual net dividend income by $ 0.70. That increase rise my YOC to 6.70%.